The iPhone and iPod Touch have become into two of the most popular gadgets because they gather in a single device, access to Internet, a multimedia player, games and all kinds of applications. The only problem is that on many occasions the files that we have ripped or downloaded to our computer aren't compatible with this kind of device and, due to this, it is necessary to convert them. iSkysoft iPhone Movie Converter is a video converter specially focused towards the Apple telephones, that has all the necessary options to be able to convert any film to a format that is compatible with these gadgets. 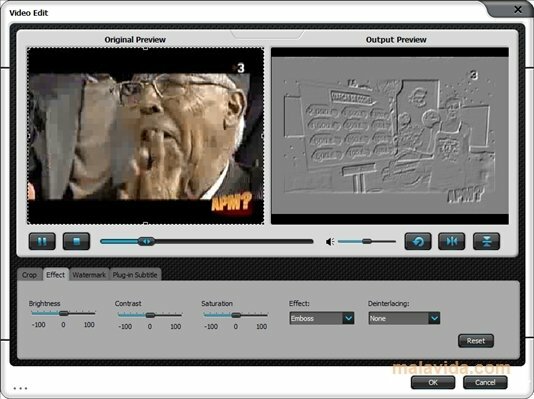 The program is compatible with MP4, MOV, FLV, AVI, VOB, 3GP, 3G2, MKV, WMV, M4V, MPG(MPEG), TS, TRP, MTS, M2TS, TP, DAT, MOD and ASF, and can export them as MP4, MOV or M4V files, allowing us to choose the file quality beforehand, and to process it applying the effects or cropping it. All the work is performed from an interface that is very intuitive for the user, that has a really well designed look. If you always want to have your favorite videos on your iPhone or iPod Touch, download iSkysoft iPhone Movie Converter.